Part of the reason I started this blog was to learn more about the process of making sound. Half of that was me writing down my thoughts and processes and thus figuring out just what it is about music or gear that inspires me and others. The other half is listening to other's comments on similar topics and applying that input to what we all do be it composing, recording, or just listening and enjoying synthesis and sound. 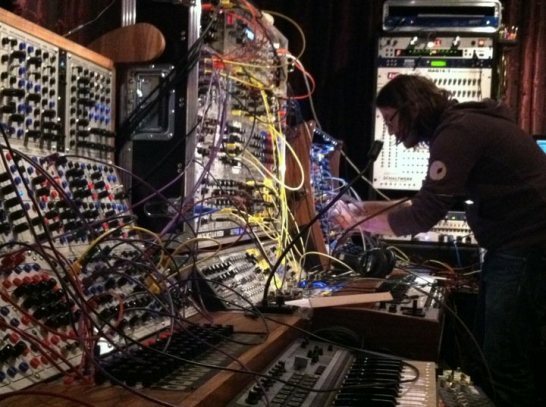 I recently came across a lecture from 2009 by musician and synthesist Alessandro Cortini. Alessandro is probably best known as a keyboardist and synth player in Nine Inch Nails as well as his projects SONOIO and ModWheelMod. His biography may be especially interesting to readers of this blog as he started out as a serious guitarist and his experience with synthesis came much later in his career first starting with software synths and plugins and then progressing to hardware instruments. He is now known as, among other things, a virtuoso of the Buchla Music Easel as well as other esoteric and classic hardware instruments. His perspective and journey offers some unique insights on the age old questions of just what prompts inspiration and how important are the tools and instruments to the composer and, in particular, an electronic musician. "Why is it so different when you have something in front of you that is supposedly the same thing and it's just I'm controlling it with the mouse in front of a computer and then I'm controlling with knobs when I have the real thing?" Similar to my previous post he discusses the benefits of computer software but then that is followed by what could only be described as a love affair with the "actual" instrument and how that offers something special as well. The fact that the instrument he is using for his demo is a Buchla 200E modular, an instrument heavily featured on this blog, is a nice touch. Other parts of the lecture that I found interesting were when he discusses how he went about recreating the synth and keyboard parts for classic and new Nine Inch Nails songs (perhaps a dream gig for many synthheads). Again, he gives a unique perspective on his "job" and walks the audience through the ups and downs of using electronic instruments and how that makes a difference on his inspiration as an artist. The presentation is audio only and broken down into two parts where he speaks a little about his background and how he got into synthesis and then does an in-depth hands on demo of the Buchla 200e system. This has been linked on a number of sites but I'll include the page from the great site Synthtopia since it includes both audio files in a useful streaming and downloadable player.